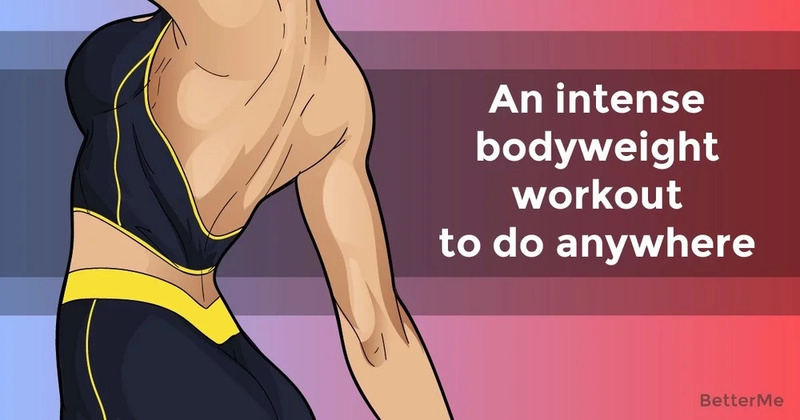 Today, we would like to present you with an intensive bodyweight workout. This workout was designed by Greatist Expert and trainer Jonathan Angelilli, and can make a real burn. So, this bodyweight workout includes exercises in back-to-back circuits to keep the heart rate up while building strength and speed. Performing this workout can take as little as 30 minutes without any heavy weights or machines. Women who want to start performing this intense bodyweight workout should have a foundation of at least one year of strength training (good health and no injuries). Before performing the greatest movements of this workout, you should warm-up. Begin by foam rolling all the major muscle groups, followed by a 5-minute jog or walk on an incline. Also, you should devote at least 10 minutes to dynamic movement prep, including knee hugs and good stretching. Now is the time to show you exercises of an intense bodyweight workout. Are you ready? So, this workout includes exercises such as Jump Lunge, Clap Push-Up, Single-Leg Glute Bridge, Side Plank Star, Handstand Push-Up, Rotating Jump Squat, Plank Balance, and Pulsing Superman. Do not forget that you need to perform 3 circuits for 10 to 15 reps for each exercise. Each exercise of this intense bodyweight workout will leave you feeling AMAZING, so you will look forward to your next workout. Just 30 minutes 3 times a week and you will fill a real burn! So, roll out your mat and start performing these exercises that hit all fitness levels! Just do it!